November 29th, 2017	| Would You Like to Become an Australian Trusted Trader? As you know Stockwells recently became an official Trusted Trader, please read the below story and let us know if you would also like to become a trusted trader, which may benefit your business. 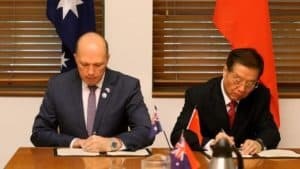 Immigration Minister Peter Dutton has signed a Mutual Recognition Arrangement with China, in a move aimed at boosting trade between the two countries. Mr Dutton and Minister of China Customs Yu Guangzhou signed the agreement in Canberra today, enabling the countries’ customs and border protection departments to recognise each other’s Authorized Economic Operator programs. “China is our largest trading partner and this arrangement is expected to bring a benefit of $440m to Australia’s economy over 10 years,” Mr Dutton said. Minister for Immigration and Border Protection Peter Dutton and Minister of China's Customs Yu Guangzhou signed a landmark Mutual Recognition Arrangement between Australia and China. He said MRAs reduced the regulatory burden on Australian businesses, and would provide faster and more efficient access to the Chinese market for Australian Trusted Traders.